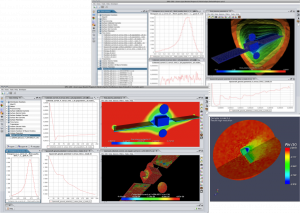 SPIS (Spacecraft Plasma Interaction Software) is a dedicated software to model spacecraft/plasma interactions, and more particularly spacecraft charging. More accurate, adaptable and extensible than the existing simulation codes, SPIS is designed to be used for a broad range of industrial and scientific applications. Initiated and partially funded by ESA and CNES, supported by numerous active contributors, like ONERA, Artenum and major European industrials actors as well as academic institutes, SPIS is developed in an Open Source approach and oriented towards a community-based development. In this frame, SPIS is already available for the whole community and is used by members of the European Spacecraft Plasma Interaction Network in Europe (SPINE) (see www.spis.org for further information). Thanks to this long term effort, SPIS is today a reference solution in spacecraft charging and spacecraft-plasma interaction analysis. The MoORa application to simplfy the handling of Monte-Carlo based models for in coupled radiations/internal charging analysis. For further information and details, please request our Detailed Offer and Pricing (DOP) documents.